Queen anne's lace is a relatively tall plant measuring approximately 30-100 cm. in height. This well known wildflower is easily identified by its flat-topped cluster of small, white flowers and fern-like leaves. The leaves and stem produce a carrot odor when crushed. The miniscule, radially symmetrical flowers of queen anne's lace are arranged in flat-topped compound umbels that measure approximately 7.5-12.5 cm in width. 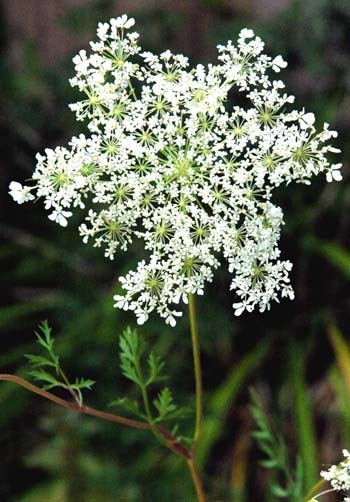 The flowers are creamy-white; however, each compound umbel also has a conspicuous, dark purple flower at its center. Each flower has rounded petals of varying size and is supported by three disproportionately long, dark green, thin, tapered sepals. The fruit is small and bristled. The leaves are long, measuring 5-20 cm. in length and are fern-like, having deep sinuses and multiple lobes. Queen anne's lace grows best in dry fields and around waste areas. Queen anne's lace belongs the carrot family. Consequently, the leaves and stem give off a carrot odor when crushed. Also named wild carrot, queen anne's lace long, first-year taproot (equivalent to the orange, edible portion of the commercial carrot) can be cooked and eaten. Queen anne's lace, although considered a troublesome weed, is popularly used for flower arranging.